My Friday evenings... they're pretty lame. Usually, I just do a little Netflix and chill, or OnDemand and chill. It's pretty lame. If I want to mix it up, I might get something for dinner, or drink a glass of wine. It's seriously unimaginative. A couple of weeks ago, my coworker Bertha told me about a yoga class she's been attending on Fridays after work. She told me that the classes were great, but, perhaps most importantly, they only cost $5. That's right, people! 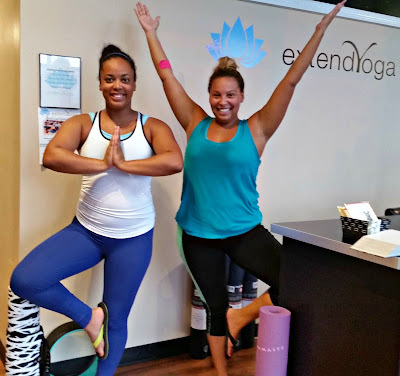 A $5 YOGA CLASS! Who knew they existed? I decided to do a little research online before making up my mind on whether to break my super exciting Friday tradition for yoga. 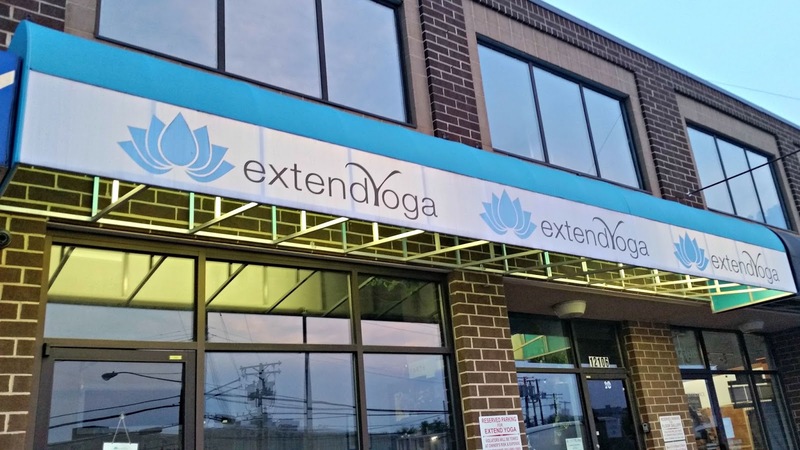 The studio is called Extend Yoga, and they have a great website, which made it pretty simple to conduct some preliminary research on their Friday classes. What I confirmed first is that they did, indeed, have a $5 yoga class on Friday. Not only that, but they offer a few $5 and $10 classes throughout the week. I work during the day, so I can't take advantage of most of them, but it's still nice to know that the option exists. The second thing I confirmed was that I wouldn't be going alone. I don't know why I'm so awkward in yoga classes, but I somehow feel less awkward when a friend goes with me. I perhaps felt a little more awkward in this class than usual (like when I fell on the man next to me, for example), but I'll get to that in just a moment. Bertha was going to go to the class again, but ended up taking a road trip for the long weekend instead. Fortunately, my friend Hannah could go, so we decided to meet up and check it out together. If you get a chance to check out the studio -- which I highly recommend -- just keep an eye out for the blue and white awning. I took a photo of it for you, so you don't miss it like I did! Okay, so now on to the actual class! The studio, while small, is very well lit and welcoming. Hannah and I hurried up and found two spaces next to each other in the studio at the end of a short hallway. There were cubbies to store your shoes outside of the room, and a water fountain, where I filled up my bottle (fortunately!). "Where is the instructor getting to set up?" Hannah inquired. I had no idea, honestly. Someone came in the room at that time and directed us to squeeze in a little tighter. Hannah and I counted about 32 people in the room at that time. The room was getting a little warm, and we still didn't know where the instructor was going to, well, instruct. Finally, he was ready to start class! That's right, HE! I'd never had a male yoga instructor in a live and in-person yoga class, so I wasn't sure what to expect. But, you know what? Our instructor, TanO Mazi, killed it! We were doing all types of poses I had never heard of or didn't know how to do properly prior to the class. While he talked us through the poses, TanO walked around and helped correct our form. I think I struck my best dancer's pose ever while he helped me really get into that pose! There was one point where I was struggling with the pose, and he came over with the yoga strap, which helped me hit the pose. It was great! For a while there, I felt like Carrie Bradshaw in one of those boutique classes she would attend with Charlotte or Samantha and have a talk about relationships. (Sorry! I did!) Unfortunately, I snapped out of that a couple of times, once, of course, after I fell on the man next to me. Other times were mostly because I was dripping sweat and sliding all over the place. He worked us OUT! Our class ended up being about an hour and 15 minutes long (maybe a few minutes longer), and I can definitely say that it was well worth the money! I have never broken a sweat during yoga that was not hot yoga, and I'm not a heavy sweater to begin with; however, I was drenched by the end of that class. Seriously swampy. I loved everything about this class! The setup was like nothing I had experienced before, and despite the proximity to my neighbors, I didn't feel cramped or embarrassed to make a mistake. The studio was clean, and I loved that they sold merchandise and beverages. Additionally, I noted that they had a little punch card for attending classes. (You'd have to call them to find out more info. I was too sweaty to think straight!) Finally, they also offered two weeks of unlimited classes for new students. I couldn't take advantage of this due to my volleyball and race training schedule, but for $20, you can take advantage of the newbie discount. Just make sure that you check out the schedule to make sure that you can really get your money's worth! 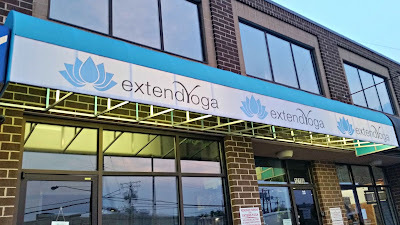 TL;DR: I absolutely recommend checking out Extend Yoga! You will get in a great sweat, and if you take the Friday class, you will kick off your weekend feeling relaxed and refreshed. If you're in the area, be sure to check them out and let me know what you think! If you are around Miami Beach, you will find a yoga teacher Miami Beach, everywhere. They will conduct early morning sessions, for you by the sea side, when it is calm and quiet and help you discover your inner self with yoga. These teachers conduct classes for a group of people, so that learning can be motivating and fun.